One of the most impressive residential streets in the city, the Belvedere Boulevard Subdivision is roughly located between the alley south of Union and the alley north of Central Avenue. Developer H. W. Brennan laid it out in 1906. The subdivision was only 3300 feet long and divided by a ten-foot wide median, comprised of five, 20-foot sections. Stone approaches are located at both ends and landscaping included shrubs, flowers and carefully tended grass. Benjamin Harvey built one of the first houses on this street in 1910. By 1923, he constructed his second and final home at 604 South Belvedere using the innovative architectural firm of George Mahan and James Broadwell (Evans Taylor Foster Childress). Their great facility in designing Eclectic styles produced this symmetrical Colonial Revival home based on the early Adam style so prized by American colonists. The home has projecting wings and a dentilated cornice. Note the arch-headed windows in the dormers, the rhythm of the modillions under the roof overhang and the impressive paneled front door with its restrained Doric columned surround. Mahan and Broadwell loved to step down the massing of their corner homes as they reached the side street, and here they extended a spacious columned portico for outdoor living on the south side where the property abuts Harbert. The garden is a multi-level terrace including oak leaf hydrangea, snowball hydrangeas, azaleas, Japanese maples, crepe myrtles (three- stories high), and a marvelous tree-style camellia. Of additional note is the three-tiered fountain set close by on the low brick wall that enclosed the side and rear yards. In 1815, three years before the founding of Memphis, pioneer Anderson B. Carr arrived here on the Fourth Chickasaw Bluff and settled 1600 acres of virgin land originally known as John Rice’s “East Memphis” tract that included present day Central Gardens. The boundaries of the vast Carr tract were present day East Parkway on the east, South Parkway on the south, Bellevue on the west and Union Avenue on the north. Descended from French Huguenots, early settler Solomon Rozelle immigrated here and purchased 800 odd acres from Carr in 1830 for $10 an acre for a cotton plantation. The former Rozelle estate contains much of today's Midtown. 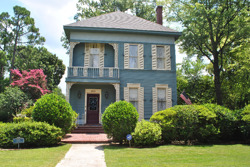 Rozelle built an antebellum style home for his wife Mary and their large family on Pigeon Roost Road (Lamar Avenue). By 1840, Rozelle had donated a two-mile right-of-way down the length of his property for the area’s first railroad, the Memphis and LaGrange (Norfolk-Southern) line. An overgrown lot at Willett and Lamar is all that remains of the old Rozell Station from which he shipped cotton to market. In 1843, Rozelle sold his son Claiborn W. (born 1821) thirty acres of the family property on which he built this fashionable 1853 Gothic Revival style residence. It is one of the two oldest homes in Central Gardens. The Rozelle House is part of the mid-19th century Picturesque and Romantic Movement in architecture, reflecting the public's newfound taste for buildings inspired by medieval design rather than from the classical forms of ancient Greece and Rome. The Gothic Revival style in America was advanced by architects Alexander Jackson Davis and especially Andrew Jackson Downing, authors of influential house plan books, Rural Residences (1837), Cottage Residences (1842), and The Architecture of Country Houses (1850). They promoted the style as an appropriate design for rural settings, with its complex and irregular shapes and forms fitting well into the natural landscape. Thus, the sophisticated Claiborn chose this style for the undeveloped plantation setting. After remaining in the Hays family for 67 years, Mrs. Evans sold the property to Stephen L. and Betty Jo Nelson in 1959. In 1960, they transferred ownership to Shelby United Neighbors where Mr. Nelson worked. In 1969, Shelby United Neighbors sold it to Judge James H. White. Known locally as “the Marrying Judge,” White presided over dozens of wedding in the home and it was customary for brides to make dramatic entrances by slowly descending the stairs. He lived here for almost thirty years until his death in 1998. Present owners are Mary & Jim Simon. The Simons credit Judge White for the excellent shape the house is in because he loved it and he took care of it. Many of the furnishings are original to the house and the Hays family. Central Gardens has homes that families have lived in for succeeding generations. One such home is this house at 1780 Vinton Avenue, the second bungalow in this year’s tour. 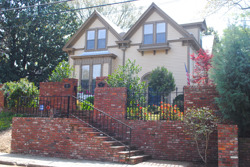 It is located on block 60 of the Harbert Place Subdivision platted in 1912 and includes Vinton Avenue, LeMaster Street, and the corresponding block of Carr Avenue. 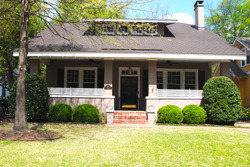 The turn of the twentieth century from 1900-1929 were the "boom years" for Central Gardens, the period in which it was "the newest, most prestigious neighborhood" in Memphis, with homes ranging from "elegant mansions to Queen Anne cottages and cozy bungalows." This inviting bungalow is simplicity itself: a big gabled roof projecting over the full front porch. Even the materials are unpretentious. Stucco above turns to brick below the first floor windows. Craftsman details included the exposed roof rafter tails with their gently rounded ends, and the decorative triangular knee braces under the deep roof overhang. The Craftsman doors and windows are similar to those used in vernacular Prairie houses. Note the triple 9/1 windows on the ground floor and the center entry with a Prairie style wood door topped with a multi-light transom. Even the shed dormer on the front has a bank of four, 6-light windows for adding light. This cross gable roof form with clipped gables may have come from the earlier Shingle style popular on the New England coast for turn­ of-the-century summer cottages. It evokes easy, casual family living - no grand entry, no reception rooms, just folks comfortably at home. The original owner, Vernon Schevenell built the house in 1925 of the same Arkansas stone used to build Idlewild Presbyterian Church and the buildings at Rhodes College. 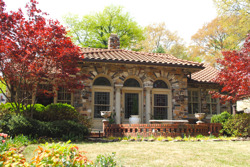 It is included in Eugene J. Johnson’s Memphis: An Architectural Guide as a sophisticated variation on a bungalow, and this symmetrical little house clearly has Mediterranean ancestry. The exceptionally well built home is a bungalow interpretation in its overall massing and floor plan. It has a hipped tile roof with a front roof extension, off-center covered entrance, and ornate exposed wood rafter details. Yet with its round-arched door and window openings, leaded glass lights, terra cotta roof tiles, and scrolled wood trim over the door, it exhibits Mission features. Further adding to the eclecticism is the use of classical columns between the window bays on the house façade. More than most, this residence incorporates a variety of the prevailing tastes among home builders of the early twentieth century. The garden’s points of interest include foundation plantings as old as the house and front garden sculptures are by Dolph Smith and Ann Klicka. This home first appears in the 1912 Memphis City Directory as occupied by Samuel G. Wilson. Wilson was a general contractor and it is likely he built the bungalow and recorded it in his wife, Elizabeth’s name in June of 1912. 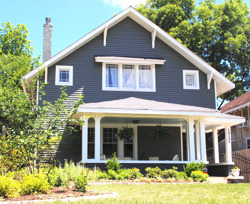 The residence is a good example of a Craftsman bungalow, the dominant style for smaller houses built throughout the country from about 1905 until the early 1920s. Craftsman houses were inspired primarily by the work of two California brothers: Charles and Henry Greene who practiced architecture together in Pasadena from 1893 to 1914. About 1903 they began to design simple Craftsman-type bungalows; by 1909, they had designed and executed several exceptional landmark examples called the “ultimate bungalows.” Several influences-the English Arts and Crafts movement, an interest in oriental wooden architecture, and their early training in the manual arts-appear to have led the Greene Brothers to design and build these intricately detailed buildings. The two-story, frame with siding, irregular plan house has a front gable, and asphalt shingle roof with overhanging closed eaves supported by brackets. The partial porch has paired box columns on a cast concrete balustrade and the incised off-centered entrance has a nine-light, paneled Craftsman style door. Other Craftsman detailing includes triple, double-hung, nine-over-one wood sash windows with wood sills on the ground floor façade and triple, nine-light paired casements with a shed roof on the second floor. Current owners Amy & Bradford Sterling purchased it in 2012. Since then they have extensively renovated and restored the home both inside and out. The Beethoven Club came into being in 1881 because of four young female pianists, apparently accomplished ones, who enjoyed playing in a quartet. By 1891, there were 60 members and the club decided to incorporate. From the beginning the focus and purpose of the club has been the performance and support of classical music, not limited to Beethoven, but covering the full spectrum of classical composers and performers. In its early years, the Club met in homes, churches, and downtown in the Women’s Society Building. By 1927, the Club had grown to the point that it purchased 217 N. Waldran and converted it to a clubhouse and recital hall. Throughout the 1930’s the hall was the scene of weekly performances presented by members as well as guest artists. Also in the 1930s, the Club began presenting nationally known artists in concerts at the old Goodwyn Institute downtown and at the Ellis Auditorium. 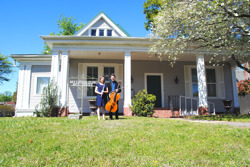 In 1953, it sold the property on Waldran and purchased the smaller property on McLean, remodeling it from a residence into meeting rooms and a recital hall. Many middle-aged and younger Memphians fondly remember playing their first piano recital in this hall. True to its beginnings, the Beethoven Club has been an incubator for innovative ideas and performances groups have “spun-off” and become important musical entities on their own. In the 1930s, the Club began sponsoring operettas, light operas and musical revues put on by amateur actors, singers, etc. These productions found such favor with the public that they soon became larger, more professional, and eventually became the Memphis Open Air Theatre or M.O.A.T., which made the Overton Park Shell its home for many summers. Similar ventures in the field of opera led to the formation of the Memphis Opera Theatre, now Opera Memphis, and an outstanding regional opera company. In 1962, the Beethoven Club founded the Mid-South Regional Metropolitan Opera Auditions, which today continues as an independent organization. Because of the auditions, three local winners became “stars” of the Met: Patricia Welting (1962), Gail Robinson, (1966), and Ruth Welting (1968). Although altered over time, the Colonial Style Composite Cottage retains much of its late Victorian original charm. It has a metal hip and gable roof with a full pediment and pent, paired double hung windows on the façade, a porch supported by paired columns and an enclosed side porch. Celebrating its one hundredth birthday this year, this apartment building is located on Part of Lot 5 in the unrecorded C. C. Tucker Subdivision. This 1917 Colonial Revival style, two-story apartment building is frame construction with masonry and stone veneer. The wood windows are one-over-one double hung. The center entrance has a multi-light and panel door. A canvas canopy provides a covered entrance out to the public sidewalk. The grounds are fenced and beautifully landscaped. George Mahan and J.J. Broadwell, members of a prestigious Memphis architectural firm, designed the building in 1915-16 for Memphis banker, J. Alma Goodman. For Mr. Goodman, this was an investment property, as he and his wife lived nearby on Snowden Circle — now part of the Annesdale Snowden Historic District. The earliest residents of the rental were doctors who lived in three of the apartments, with the fourth unit housing the staff who cooked in the building’s only kitchen, and otherwise took care of these distinguished men. Nancy Willis, the current owner, transformed the building’s foyer with fine moldings, marble flooring, and specialty finishes. Bringing back the swimming pool to its former glory was a major ordeal as, among other things, it had accumulated tons of garbage over the years. 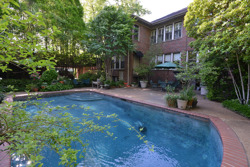 Today, the pool is once again the heart of the back courtyard. There are also four garage spaces for tenants, a handy plus in such a busy neighborhood. While it was once a “family place” during the Fulenwider years, Willis says that to her mind her building “still is just such a place, as her tenants are like her family.” Nancy Willis believes this is an ideal way to live - privacy when desired and cocktails in the courtyard when the mood dictates. “In essence, it’s more than just a house; it’s a lifestyle.” Photo provided by Andrea Zucker Photography. The Disciples of Christ denomination began in Memphis in 1843 in a private home on Front Street in what was then the town of South Memphis. By 1851, the congregation was able to purchase an old school building on Mulberry Street at Talbot that they remodeled into a church called Linden Avenue Christian Church. Several other mission churches flowered from this “Mother Church” including one in what would ultimately become Central Gardens. 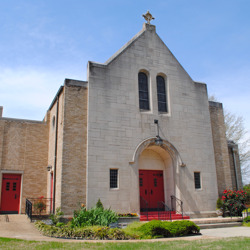 The Midtown congregation first took shape as East End Christian Church in 1923; the people formally organized themselves into a church with 100 charter members. The congregation purchased a lot at the corner of Peabody and McLean for $8,400, and called their first resident minister, Rev. W.P. Crouch. Reverend Crouch passed away in 1925, ending a brief but aggressive ministry as Central’s first pastor. The daring and courageous J.J. Walker was called and began a ministry of over twenty-two years spent building the congregation and the original structure. Though the membership has declined in numbers since the early 1950’s, the congregation has remained strong in program activities and a sense of mission. While other congregations have moved to suburbs, Central has remained committed to Midtown. In the spring of 1994, they symbolized their commitment in a campaign of church renewal called “Turn the Light Back On!” The blue neon Celtic cross atop the building, dated from the 1950s, was darkened and forgotten. On a Palm Sunday evening, the revitalized congregation turned the light back on, along with floodlights. In the years since, there has been no slackening of the congregation’s sense of mission and service to all. Its ministry to midtown children and youth, especially those from an impoverished neighborhood, demonstrates this commitment. The church has a very strong and active women’s ministry that reaches out and provides support to several local agencies and organizations that provide services to others. Central has had a glorious past and it continues with a vigorous faith in the future of the congregation and with a vision of ministry still ahead.